I bought this fabulous brown silk with hexagons on it from the Bolt sale this past weekend. 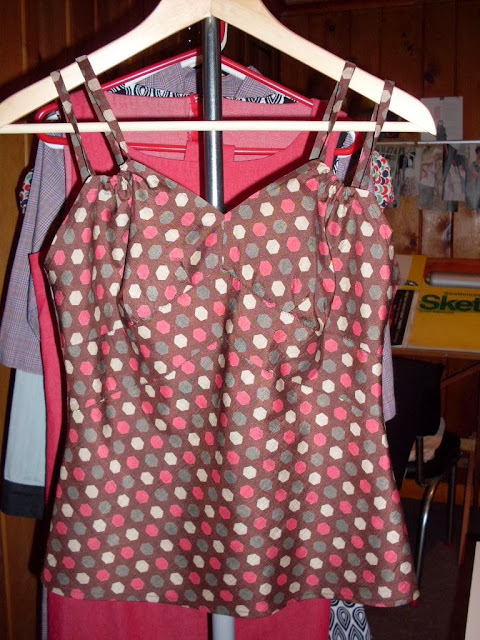 I thought it would be perfect for the Cinnamon camisole, another great pattern from the local Colette Patterns. The pattern is very easy to follow and sews up quickly, the perfect criteria for a weekend project that gives you gratifying results. I think it turned out really cute, but perhaps the silk is a bit too heavy, in terms of not having enough stretch on the bias. I chose this particular fabric because I wanted something that could also be worn as a tank rather than only as an undergarment. The one mod I made was to do a small bust adjustment, which turned out to be a rather large bust adjustment (I made the size 4). Don't you think this cami would be cute sewn up in a Liberty fabric? I bought this pattern too, I had some problems attaching the straps. It looks a little funny & hangs strangly.